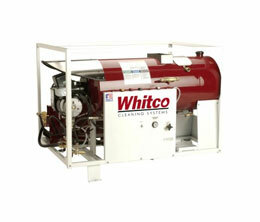 We are a dealer for the Whitco Cleaning Systems line of industrial pressure washers. These cold and hot water machines are built to last. 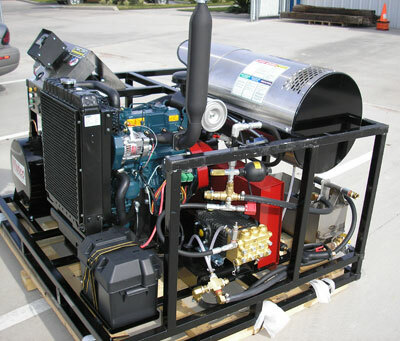 Pressure washers sold at retail stores may advertise being rugged high pressure units but truth be told they are often built to be used 20 hours or less and then thrown away. The units we offer will stand the test of time. 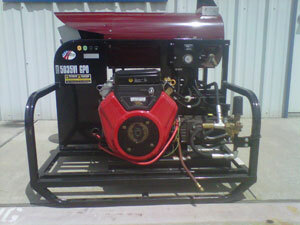 Cleaning power units are a big consideration when purchasing a pressure washer. 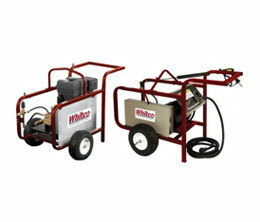 For example, the Whitco 5040VI GPO model is a 4000 PSI pressure washer that puts out 5 gallons per minute at 4000 pounds per square inch. (5 GPM X 4000PSI = 20,000 CPU) A 4000 PSI pressure washer bought at a retail store may put out 4000 PSI but at 2.6 GPM. So the cleaning power units (CPU) would only be 10,400. The more cleaning power units, the faster you clean! Another factor to keep in mind is maintenance. If it malfunctions, who will fix it? 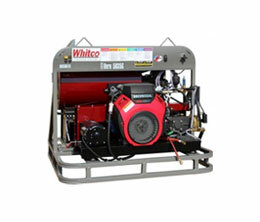 As a Whitco dealer, we offer service and we stock parts. One of the most impressive units we offer is the Model 5050K 5 GPM @ 5000 PSI powered by a 26 HP Kubota diesel engine. Hot or cold water, these units outlast any others on the market today. 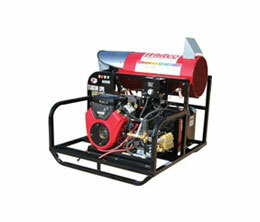 The 5040VI GPO is a 5 GPM @ 4000 PSI pressure washer (hot water) with a gas engine does the job and then some. The 5035VI GPO, which is slightly smaller, is pictured below. 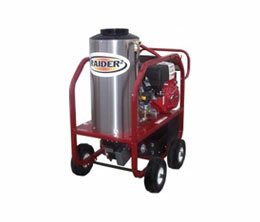 Both these units are very affordable and offer terrific cleaning power and durability. Contact us for a quote today! 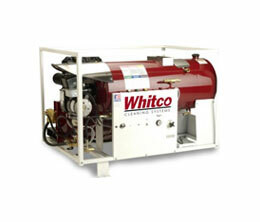 Please view the complete line of our gas and diesel engine pressure washers.